It’s time to take your N-Strike battling to the next level with the Rampage blaster! With a 25-dart drum magazine, the Rampage blaster gives you an incredible rapid-fire blitz, firing revolutionary Elite Darts at a range of 75 feet. Release a storm of darts at your target by sliding the slam fire handle repeatedly while you hold down the trigger! 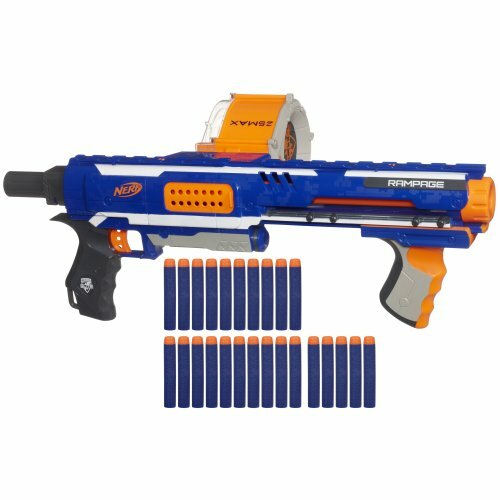 The drum magazine works with other Clip System blasters (sold separately), and the Elite Darts work with any Elite blaster and most original N-Strike blasters (sold separately). For the final word in today’s blaster technology, you need the Elite customization and interchangeable parts of the Rampage blaster!